We partner with schools, faith groups, businesses, and community organizations to develop year-round (PIE365) programs and experiences that promote the skills and values needed to create a humanistic, culture of peace. Our PIE365 programs consist of three foundational pillars, the (3P's): People, Peace of Mind, and Peace Pie. Our mission and goal as a non-profit and peacemaking movement is to create programs and experiences that promote the skills and values needed to build a humanistic, peace-centered culture. We do this through our three main programs: PIE Circles, PIE Socials, and Peace PIE. Each of these programs encompasses our 3 P's of Peace, building on them in unique and engaging ways. Peace PIE is a celebration food and signature peace offering for our grassroots movement. Savory or sweet, family size or handheld recipes, Peace PIES are shared as a symbol of support, gratitude, kinship, and love. Food nourishes us and brings us together. Shared food traditions teach us about other ways of life in cultures around the world. Savory or sweet, empanadas, samosas, fruit, veggie, nut, cream or pizza pie - any recipe can be a Peace PIE if served with that intention. The first Peace PIE was baked to celebrate the 1995 MLK Holiday. Peace PIES are the culinary choice for Peace through PIE Socials and PIE Circles. Because Peace PIE is a symbol of peacemaking, many schools, community groups, and organizations choose to make unique versions out of paper and other art materials.This activity offers a creative way to experience the relationship between each individual piece and the Whole PIE. Peace through PIE is partnering with community PIEoneers to develop signature Peace PIES, as part of our vision for creative conflict resolution with a food offering. 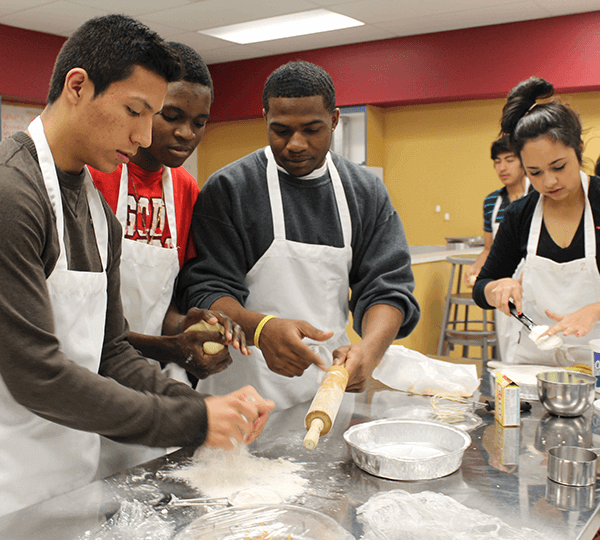 William B. Travis High School Culinary Arts students in Austin, Texas led by Chef Adam Phillips, were the first PIEoneers to make Peace PIES for their PIE Circle (Spring 2018). Funds for the event were provided by community partner HEB. Anyone can make a Peace PIE to share unique cultural traditions and connect with others. This offering can take the form of an “eating pie” or a pie made of paper or other materials. Reach out to your community to host a PIE Circle or Peace through PIE Social. Be sure to include Peace PIE. Because PIE means Peace Includes Everyone. 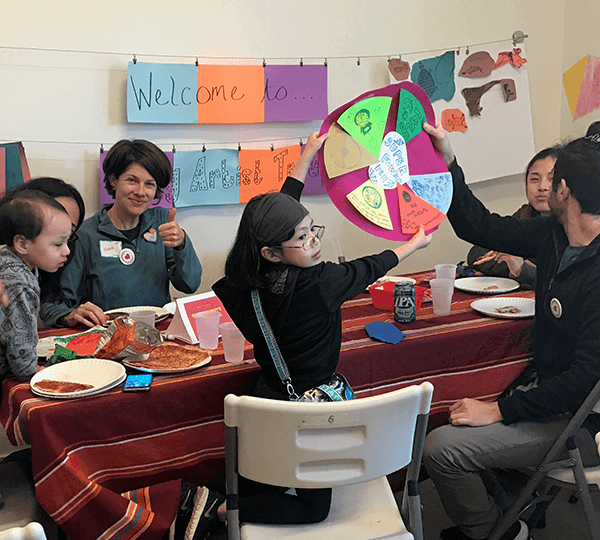 Host a Peace through PIE Social to build new relationships, celebrate diverse cultural traditions, practice courageous conversations that foster understanding, and share Peace PIE together. Each Social is unique, customized by the hosts to meet specific goals of their group. One year, a 5th grade math class in Cleveland, Ohio hosted a January MLK PTP Social that included a learning lab about hunger, homelessness, and soup kitchens in the community, Math lessons on making a recipe, and delicious Peace PIES donated by a local bakery. The next year, all grades co-hosted a school-wide social with an I Have a Dream musical program, poetry readings, mural size Peace PIES created with large paper slices, a Peace-themed Art Show, and Peace PIE for everyone (pizza and dessert pies). St. James Episcopal in Austin, TX hosts a PTP Social every MLK Eve Sunday, just after morning services. This colorful event features a live Peace PIE auction with savory and sweet pies from many traditions, along with pizza pie served by the Youth Group. Proceeds benefit special community causes. 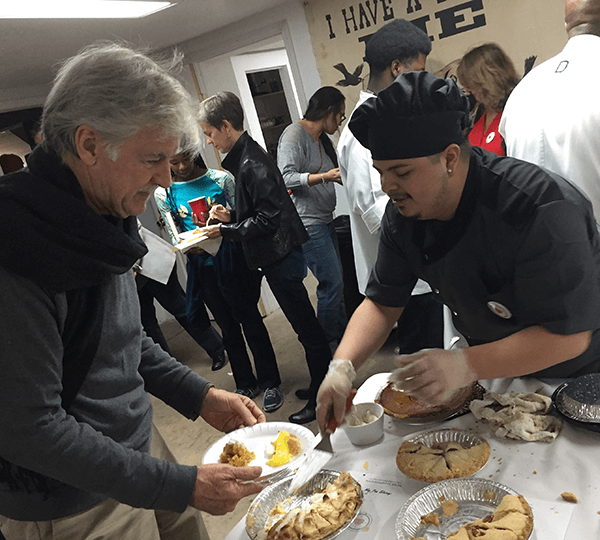 Austin’s William B. Travis High School hosted a Peace through PIE Social in the spring, as part of their PIE Circle conversation exploring the age-old relationship between food and conflict resolution. 1500 participants enjoyed delicious hand-held Peace PIES baked by Travis Culinary Arts students. Reach out to your community and host your PTP social any day of the year. Plan a January MLK Peace through PIE Social to help grow the MLK culinary tradition of sharing Peace PIE. Check out the PIE Stories to learn more. Choose from our prize winning Peace through PIE Social menu. (MLK Peace through PIE Social info and link). It’s PIE Time! A PIE Circle is a method of practicing guided conversation in order to listen respectfully, offer thoughtful feedback, build trust, and foster healthy relationships. PIE Circles create Welcome Spaces and cultivate Peace of Mind. A PIE Circle is based on an age-old form of conflict resolution, where a circular arrangement offers guided opportunities for each person to have their voice heard. Number of participants, theme for conversation, and length of time can be customized. So can the basic ground rules everyone agrees to honor. An important component is a “Talking Piece” (any small object that fits comfortably in the hand, such as a ball of yarn, smooth rock, or fabric bean bag). One person is appointed as the guide. Only the person holding Talking Piece has permission to speak, as the conversation makes its way around the circle. Everyone else agrees to wait their turn. Communication skills gained from this basic practice can be exercised at home, at work, and in the community. Peace through PIE’s inaugural PIE Circle program took place in Austin, Texas at William B. Travis High School (April 2018). 1400 students shared guided conversation in groups of 140 circles. The theme for this event was the impact of sharing food in conflict resolution. Individual handheld PEACE PIES were created for all participants by Travis culinary students led by Chef Adam Phillips. Check out our video from this event below!